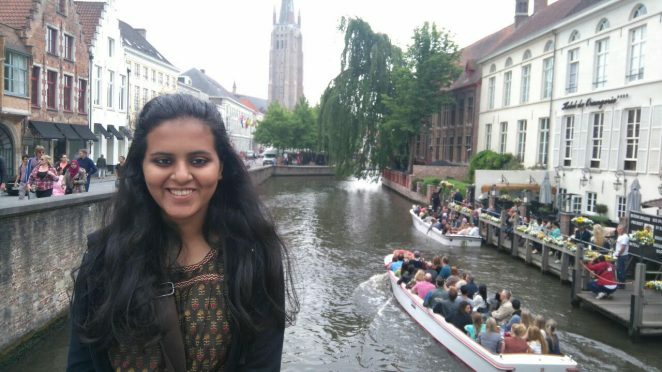 About the Author: Jamila Siamwalla from NIFT Mumbai shares her journey of a research internship with a textile design research lab in France. It is the end of May, and a fulfilling view of the Eiffel from above, the flight had just landed with dewdrops on the window pane. And the journey had just begun, and was getting better with time, starting with a train from Paris to Lille, towards northern France. All about to start with a new beginning, I was very much near in enriching the epitome of all the learning. And now all set to start, I was the the only intern in the human centered design research group at GEMTEX Lab. My project was in the field of 3D virtual garment design with human experience. I was guided by two head professors who specialized in the fields of sensory analysis, data processing, decision making, virtual design, and a PhD scholar. The working culture at the lab was unique with focus on personal development and growth. It also involved attending seminars of the other departments which were involved in textile chemistry and composites. And yes of course, the French have an aura about them. The technology savvy nation very much amazed me. From my house to the Lab, I used to take the underground metro which is world’s first automated driver less metro line. They also believe in quality work management skills, and no doubt, enjoy their special lunch breaks. It is also difficult to resist from their baked delicacies. Though there were occasional language problems, but that was never experienced at the lab. The final project report was prepared on the impact on sustainability due to virtual garment design. The project dealt with concepts regarding fit, comfort, style approach, human perception and slow fashion. In turn, how virtual design helps in providing solutions, to all the factors for the ease of garment manufacturing process. It involved indefinite time of reading, noting points, making systematic diagrams etc. Coming to Lille, it is known for the least amount of sunny days it gets throughout the year. But with the internship, I did get to experience its pleasant summer. The antique architecture, the footpaths, street lights, and never ending walks in the evening were a part and parcel of the internship. Though the process of finalizing the internship between NIFT Mumbai and GEMTEX was quite a long process, but in the it was worth it. More than experience, I would say it was a fulfilling odyssey. Editor’s Note – Do you also want to travel the world for your internship? Check out these exciting international internships on Internshala. We are both proud and happy to hear that you have been honored to achieve this goal. Wish and pray that you attain success in your future endeavors and fulfil your dreams. Excellent Jamila, I am proud of u. Keep up the hard work and see how they give u good results. U r very talentedand a very good girl. Hat’s of to u. Thank you so much for the wonderful wishes, does mean a lot. Well grafted. Just a stepping stone for many more to come. As in says never be satisfied and try to raise the bar always. Thank you so much, will surely do that. M Y D O A W I T H U ! !